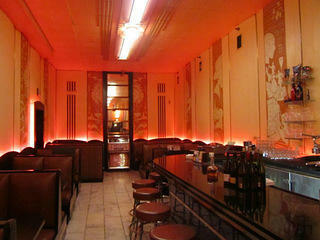 The c. 1933 Cruise Room boasts intimate booths, a jazzy soundtrack and vintage Art Deco décor. Denver’s legendary Cruise Room boasts the title of the city’s oldest bar, opening just one day after Prohibition was repealed in 1933. Located in downtown Denver's oldest hotel, the circa 1891 Oxford, the bar initially made a name for itself by serving martinis and, more recently, upscale cocktails in an Art Deco atmosphere modeled after a lounge on the ocean liner Queen Mary. Although the Cruise Room has changed hands and menus over the years, it’s still a great place for friends to gather, flanked by red neon and chrome accents and murals that stretch to the ceiling. Manager Tim Pence describes the bar’s popular Red Widow cocktail as being a mix of peach vodka, St-Germaine elderflower liqueur, fresh lemon juice, house-made simple syrup, jalapeno juice, and raspberries, topped off with a splash of champagne. 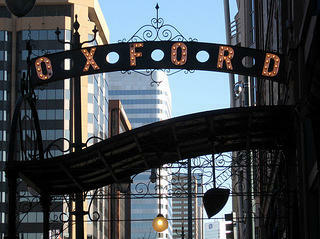 Denver’s Oxford Hotel, built in 1891, is the city’s oldest. While the Oxford Hotel’s stock dropped somewhat in the ‘50s, becoming a “flophouse” refuge for retired railroad workers, it was restored to its former glory under new ownership starting in the ‘80s and now boasts elegant furnishings and high-profile clientele. The Cruise Room underwent a restoration in 2012, with booths being taken out for cleaning and repairs and a fresh coat of historically accurate paint returning the walls to their original light orange glory. 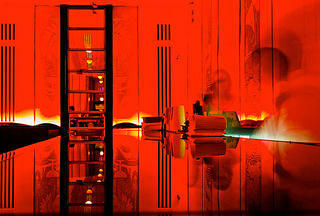 Now, the red-lit room is as elegant as ever, remaining a popular destination for dates and meet-ups. The Cruise Room operated for many years as a martini bar; more recently, they've introduced a cocktail menu. Hours: Sunday through Thursday, 4:30 p.m. to 11:45 p.m.; Friday and Saturday, 4:30 p.m. to 12:45 a.m.
What to order: Try the aforementioned Red Widow or the Bourbon Potation, a mix of Colorado-made Breckenridge Bourbon, Domaine de Canton ginger liqueur, apple butter, and fresh sage leaves. Best Yelp reviews: "This is the type of place that could be the setting for a great noir. The walls are red and so is the lipstick on the the waitresses." "You realize time doesn't matter here. You could be in any decade. The urge to order a martini is overwhelming. Visit the jukebox. Turn off your phone and just enjoy this place for what it is." "Romance is always in the air at the Cruise Room! The service and the drinks are consistently excellent. It's a small place, but the atmosphere really packs a wallop." Also check out: The downstairs restrooms are beautifully decorated with vintage marble and tile work. They also might be haunted.